Once a month three friends come to lunch at Linderhof. It's an 8 year tradition starting the January after I started staying at home. 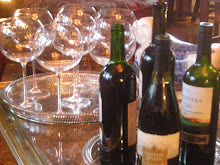 It's fun for me and I have a great time pouring over cookbooks to find new foods for these luncheons. I always try new recipes for this luncheon and so far they've all turned out. Besides the food, part of the fun of having these luncheons is setting the table. In June, I picked a big bouquet of parsley blooms for a blue and white vase that I put in the center of the table. 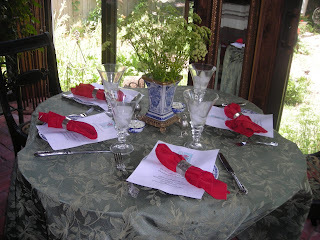 A green tablecloth and bright red napkins in my silver napkin rings. The red echoing the strawberries in the dessert. 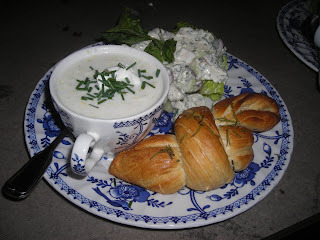 It was a simple meal -- chilled fresh corn soup, chicken salad with basil cream and a roll sprinkled with rosemary and served hot. It was a hot day on the prairie and the cold soup and chilled salad tasted especially refreshing. For this meal I used my breakfast room plates -- blue and white as so many of my dishes are with little birds for we so enjoy watching the birds from the breakfast room table. The matching tea cups served as soup cups. 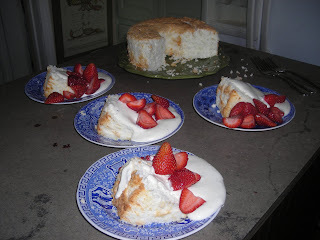 Dessert was Ina Garten's lemon angel cake because I had 12 whites that needed using. With a big spoon of whipped cream and strawberries. We enjoyed the luncheon, talking and visiting and the afternoon passed all too quickly. 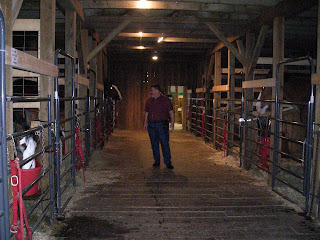 Soon, they were saying goodbyes and I was back in the kitchen doing the dishes. It’s time to say goodbye to the pansies that are in the flowerboxes front and back at Linderhof. Pansies are one of my favorite flowers and I am always so excited in the fall when they are back on the market. Often, these fall pansies will last through the winter, blooming when winter days are warm and then really putting on a show once temperatures warm up. They’re surely my spring friends as they bloom and bloom and I use them often – in salads for their yellows and purples add to the greens of spring lettuces and as a topping for cupcakes and cakes. The purple ones look especially nice on chocolate and I like the yellow or purple ones on a white frosted cake or cupcake. And although it is time to say goodbye, I savor spring and pansy flowers by candying several cooky sheets full. It’s easy to do. A wee paintbrush (used just for this purpose), egg white and sugar. I cut the stems close to the flowers, then brush with egg white and dip in sugar. I leave on the cooky sheets to fully dry. Their ready to decorate cakes and cupcakes all year long. I didn’t realize how dear these candied pansies were until I went to a gourmet food store and found my candied pansies – 8 for $24. It would seem that I have a small fortune in the tin in my pantry! I also like to bake with pansies and these cookies are so pretty and so like spring. I’ll make my last batch with the few pansies I have left after I’ve finished candying the pansy flowers. They’re tasty and great for tea. Iced tea in the garden with a plate of these cookies – a way to say goodbye to spring and hello to summer. Cream the butter with 1 ½ cups sugar. Mix in the eggs. Dissolve the baking soda in the milk and add to the mixture, along with the vanilla. Sift the cream of tartar, flour and salt together and stir into the creamed mixture. Mix thoroughly. Gather the dough and wrap in cling wrap or parchment paper. Chill for 20 minutes. Roll the dough out on a floured surface to 1/8 inch thick. Cut out circles approximately the size of the pansy blossom. Bake on ungreased cooky sheet for 5 minutes. Remove from the oven and brush the tops of the cookies with the egg whites. Place one pansy on top, spreading out the petals and topping with a bit more egg white. Sprinkle with the remaining ½ cup of sugar and cook 5 minutes more. Let cool before serving. Today is Midsummer's Eve. A night that the fairies come to the garden. And we do have fairies in the garden at Linderhof. This fairy lives in our herb bed. It's not fairy dust in her hand but rather bird seed and often, the birds will light near her hand and take their morsel from the stash before she blows it into the garden. And we made a garden for the fairies. A wee garden for the wee folk. Sometimes we do have fairies come to the garden and I think I captured one in the garden. Often, I think at night I see lights shining from the house as fairies go about their housework before settling down for bed. 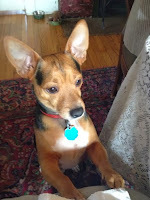 And to prove that we believe in fairies, we have a corgi. They were originally dogs for the wee folk of Wales. The fairy queens would hitch corgis to their coaches on Midsummer's Eve and on the first full moon in October. And if you don't believe me, just look at a corgi -- all corgis have the harness marks of the fairy coaches on their backs. Oliver certainly does. And tomorrow, he shall be an especially tired dog we find. He sleeps most of the day having been up all night with the fairies. 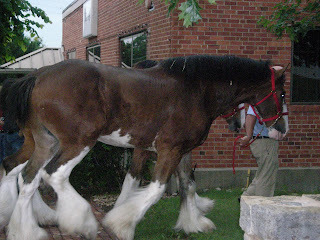 The church that we went to when we lived in the little town 20 miles from us has an annual salad luncheon -- and they've done it for 29 years. 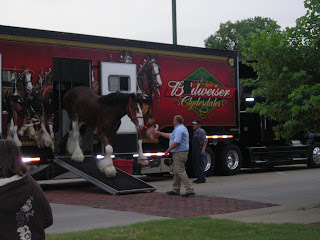 Of course, when we lived in that town and went to that church, I was involved in the luncheon -- from being the decorating chairman, to food committee, to chairman of the whole event! Even after we moved, I've always attended the luncheon and it is definitely a highlight of June. I always take a carload of prairie friends with me and we enjoy sampling and tasting and some of my best salads have come from this salad luncheon. 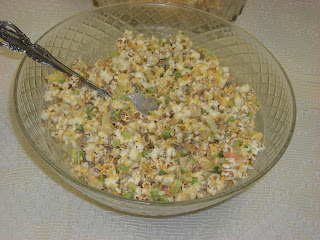 This year they had a really different salad -- popcorn salad. Not popcorn shrimp but real popcorn! It did look a little strange -- a bowl of popcorn on the salad table but . . . . I had been told that was one of the offerings this year and so was very curious to sample that salad. Daughter Sarah, when I told her about it said that her company cafeteria (in Minnesota) had the salad twice a month and her co workers got really excited when it was "popcorn salad day"! 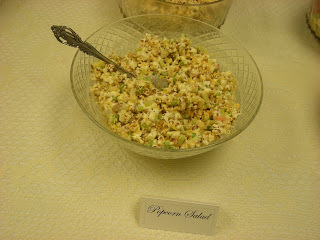 With great surprise, I found that it was one of my favorite offerings of this salad luncheon. The taste was surprisingly good. It's not a salad that I will make for just the two of us, but at our next church potluck it may be my dish of choice to take. Partly because it is good but partly because of the novelty of the salad. If you want to take the dish that's the most talked about at your next potluck, I suggest taking this salad! Mix water chestnuts and next four ingredients ina large bowl. In a small bowl, whisk mayo, sugar and vinegar together. Pour over water chestnut mixture. Just before serving gently fold in one 7 oz. bag of popcorn. Serve immediately. Popcorn will shrink after it sits. 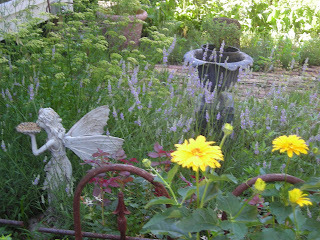 Somehow gardens and cherubs go together. 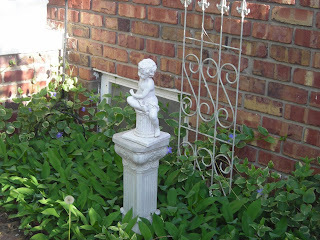 What is a garden without a cherub on top of a birdbath or peeking around a garden plant? Linderhof's garden is no exception and we have several cherubs in our garden. This little guy spends the winter in the breakfast room for I love to have garden ornaments indoors in the winter. 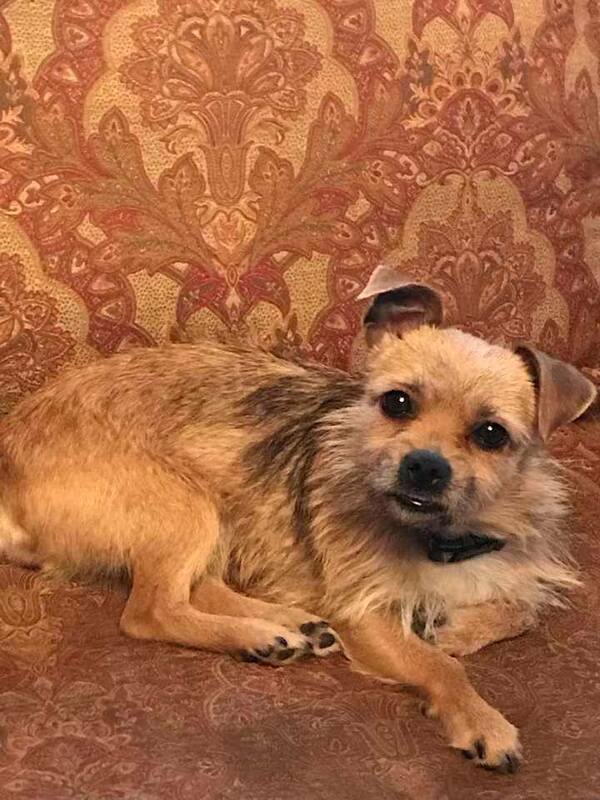 He's armless but has character and a sweet face. 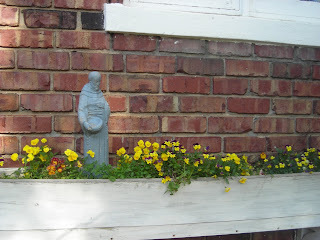 He presides over the perennial gardens on the side of the house. 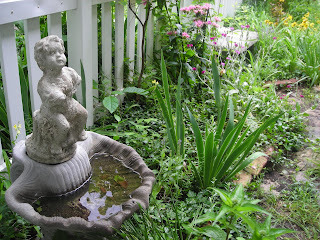 This is a small cherub in the birdbath between the drives. He's old, started life as a fountain and his base is cracked. 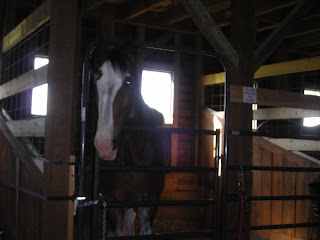 But he brings a smile to my face each morning as I make the breakfast coffee and peer out at him. This cherub is a sham. A very inexpensive Hobby lobby purchase but he looks as good as his concrete brothers! The base is real but he is not and his kingdom is the lilies of the valley below! What would gardens be without cherubs? The gardens at Linderhof would be a much duller place, that's for sure. 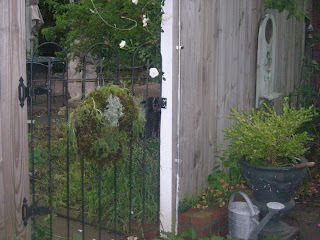 We put wreaths on our doors to say welcome and what better way to say welcome to the garden that a wreath on a gate. But not just any wreath -- a true garden wreath. The gate to the back garden -- the herb garden -- has a living wreath of thyme plants with an artemesia as a "bow" at the top. What better way to say "spend some thyme in the garden" that with a wreath of thyme. They're easy to make with a metal wreath form, moss and dirt. Keep moist and the thyme plants will fill out the wreath. I've used three types of thyme -- creeping, French and English so the wreath will have different texture. 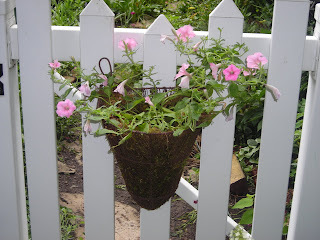 Since the side garden (or my secret garden as husband Jim calls it) is my garden of flowers, an old triangle metal hanging basket was used for one single Vista bubblegum petunia plant. The process is the same -- the basket is lined with moss, then filled with dirt and the plant put in and then hung on the garden gate. 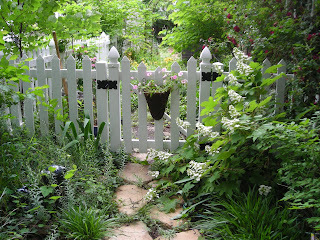 It's a way to say welcome and to let visitors know that this is a garden -- not just a "back yard"! The petunia should grow and spill down the front of the basket. It's an old fashioned flower garden and what better way to say welcome that with a basket of petunias! At Linderhof -- at least upstairs you should always look up! 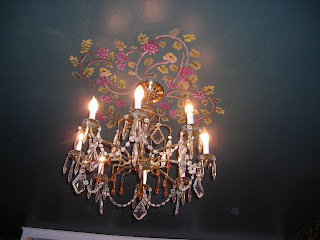 For I've come to paint the ceilings -- creative painting around the light fixtures. This is in our sunroom and was my first. 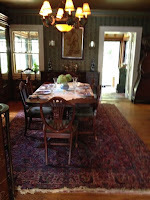 The colors were chosen to compliment the border in the room and yes, the ceiling is dark green. Except for the kitchen, the ceilings at Linderhof are never plain boring white. We have a mirror on a tall piece of furniture that reflects the chandelier as well as the decorative painting thus doubling the impact of this my first "work of art". We hung a new chandelier in the upstairs bathroom and it threw an interesting reflection on the ceiling and so with ladder in tow and paint in hand, I "painted" the shadow. I found, however, that I had to paint at night for the shadow didn't really show up in the daytime! 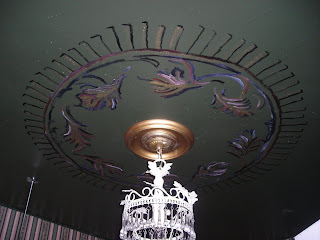 At night it is an interesting effect with the painting on the ceiling emphasized by the shadow from the chandelier. I wanted to do something in the guest room and often in meetings I would draw sketches of what to do with that ceiling. 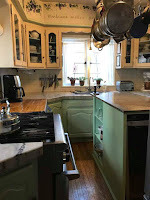 I must admit that some of my plans were grand -- too grand actually -- for they would have started painting about a foot out all around the ceiling and then do decorative painting out from each corner. But sketching plans on paper is not the same as standing on a ladder with a paper plate of paint and I realized that these grand sketches would not be doable. And then at a flea market I ended up with an Old Victorian magazine in a bunch that I had purchased. Leafing through the magazine I saw a glimpse of a ceiling painting around a light fixture. And so, I made my interpretation of that partial picture. It's still bigger than either of the others -- six feet across and unlike the others, it is done in oils rather than acrylics because of the roses. I enjoy the decorative ceilings upstairs and it was fun to let my creativity flow to make Linderhof's ceilings unique.